Window watchdogs provide a mechanism for detecting software failures in two ways, firstly an early reset of the watchdog and secondly a failure to reset the watchdog in time. In this post we investigate how the window watchdog can be use and illustrate with some examples. Writing 0 to bit 6 will cause the microcontroller to be reset immediately. Switch the Window Watchdog on (set to 1) or off (set to 0). where WWDG_CRinitial is the initial value in the WWDG_CR register. The default reset value for this register is 0x7f which means that the counter can be reset at any time. In this case, a reset will only be generated if the counter drops below 0x40. One important point to note is that when the window register is used the value written to the counter (WWDG_CR) must be between 0xc0 and 0x7f. This causes the counter to be reset and the counter value to be reset simultaneously. The first thing we need to do is add some code which will be used in all of the examples. 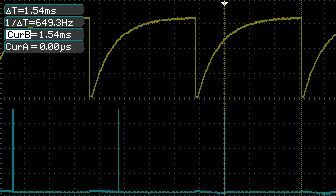 //  Setup the system clock to run at 16MHz using the internal oscillator. CLK_ICKR = 0;                       //  Reset the Internal Clock Register. CLK_ICKR_HSIEN = 1;                 //  Enable the HSI. CLK_ECKR = 0;                       //  Disable the external clock. while (CLK_ICKR_HSIRDY == 0);       //  Wait for the HSI to be ready for use. CLK_CKDIVR = 0;                     //  Ensure the clocks are running at full speed. CLK_PCKENR1 = 0xff;                 //  Enable all peripheral clocks. CLK_PCKENR2 = 0xff;                 //  Ditto. CLK_CCOR = 0;                       //  Turn off CCO. CLK_HSITRIMR = 0;                   //  Turn off any HSIU trimming. CLK_SWIMCCR = 0;                    //  Set SWIM to run at clock / 2. CLK_SWR = 0xe1;                     //  Use HSI as the clock source. CLK_SWCR = 0;                       //  Reset the clock switch control register. CLK_SWCR_SWEN = 1;                  //  Enable switching. while (CLK_SWCR_SWBSY != 0);        //  Pause while the clock switch is busy. //  Configure all of Port D for output. This code has been used many times in The Way of the Register series of posts. It simply sets the system clock to the high speed internal clock and configures Port D for output. This example sets the Windows Watchdog running and then waits for the watchdog to trigger the system reset. We indicate that the application is running by generating a pulse on Port D, pin 2. //  Initialise the Windows Watchdog. The __no_operation() instruction in the above code allow the pulse to stabilise on the pin. The WWDG_CR is set to 0xc0 to both set the value in the counter and enable the watchdog at the same time. This sets bit 6 in the counter to 11 and the remaining bits to 0 (i.e. the counter is set to 0x40). The effect of this is that the first down count event will cause bit 6 to be cleared and the counter to be set to 0x3f. This will trigger the reset event. 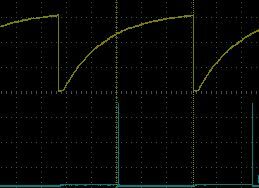 The yellow trace shows the reset line being pulled low and gradually returning to high. 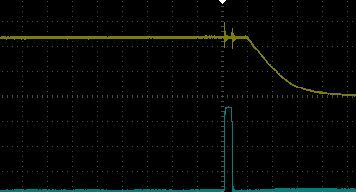 The drop shows where the watchdog has caused the reset pin to be pulled low and the microcontroller to be reset. The blue trace shows the pulse on PD2. If we measure the time difference between the pulse on PD2 and the time that the reset pin is pulled low we find that this is 770uS. This is very close to the time for one count, 768uS. Measuring the time difference we get a value of 6.9mS. WWDG_CR = 0xc1;             //  Trigger a reset. 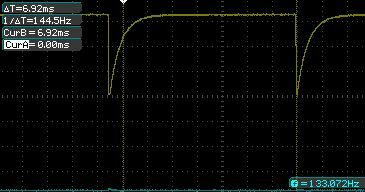 As you can see, the system is reset almost immediately (there is virtually no time between the pulse on PD2 and the reset line being pulled low). WWDG_CR = 0x5b;         //  Approx 70ms total window. WWDG_CR_WDGA = 1;       //  Enable the watchdog. This code defines a period of 11.52ms where we cannot reset the window watchdog counter followed by a period of 9.216ms during which the watchdog counter must be reset in order to prevent the microcontroller from being reset. WWDG_CR = 0xdb;     //  Reset the Window Watchdog counter. The initial pulse on PD4 indicates that the application has started. We can use this to detect the reset of the microcontroller. In this trivial application the main program loop simply checks to see if the current value of the counter is less than the value in WWDG_WR. If the counter is less than WWDG_WR then the system write a new value into the counter. The value written is 0x5b anded with 0x80, this brings the reset value into the value range (0xc0 – 0xff). This application also pulses PD2 to indicate that the watchdog counter has been reset. As you can see, there is an initial pulse showing that the board is reset (top trace) and then a series of pulses showing that the counter is being reset (lower trace). Each up/down transition represents a watchdog counter reset. This is a relatively trivial example so let’s spice this up and add in a timer. //  Setup Timer 2 to generate a 12.5ms interrupt. TIM2_PSCR = 0x02;       //  Prescaler = 4. TIM2_ARRH = 0xc3;       //  High byte of 50,000. TIM2_ARRL = 0x50;       //  Low byte of 50,000. TIM2_IER_UIE = 1;       //  Enable the update interrupts. TIM2_CR1_CEN = 1;       //  Finally enable the timer. This method will set up timer 2 to generate an interrupt every 12.5ms. //  Timer 2 Overflow handler. TIM2_SR1_UIF = 0;       //  Reset the interrupt otherwise it will fire again straight away. The interrupt will, on first invocation, initialise the window watchdog. Subsequent invocations will output the values of the registers and reset the window watchdog. //  Initialise the clock and data lines into known states. SR_DATA = 0;                    //  Set the data line low. SR_CLOCK = 0;                   //  Set the clock low. //  Set the clock and data lines into a known state. The decoded register values can be seen above the data trace. The first value is the current value of the counter. The second value is the value in the window watchdog register and the final value is the new value in the counter register. The Window Watchdog provides a mechanism for the developer to detect software faults similar to the Independent Watchdog but further constrains the developer by defining a window where a counter reset by the application is not allowed. Saturday, July 5th, 2014 at 5:48 pm • Electronics, Software Development, STM8 • RSS 2.0 feed Both comments and pings are currently closed.